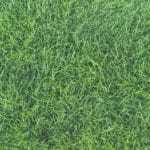 Maintaining a healthy, green lawn is no easy feat. 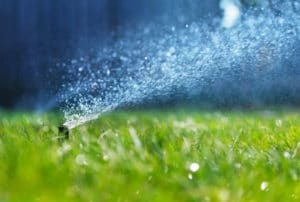 Proper watering is one of the most important parts in achieving the lawn you want. Read on to learn about how to plan a watering schedule based on weather conditions and your soil type. Water retention is best in soil types made up of silty loam, clay loam, and silty clay loam. These types of soil require an average 2½” of water per foot. Water penetrates quickly in sandy soil. Watering in separate applications is often the best answer for sandy soil, but be sure not to water more than three times a week. 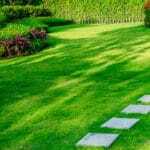 Your yard’s layout can influence how often you water, too. Water will run downhill on hills, slopes, or slants in your lawn and won’t absorb an ideal amount of water. Humid conditions: water between 10:00 pm and 6:00 am. Hot, arid conditions: watering before sunrise. Cooler conditions in the growing season: before 10:00 am or after 6:00 pm. 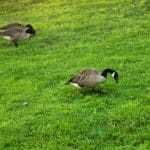 Leave time to let your lawn absorb water before watering again. Waiting allows for a healthy relationship between the moisture and air, which helps your lawn develop healthy roots. When your lawn requires water, the signs will be visible. Try this test before watering: walk across the grass and check the lawn behind you for footprints. Another way to tell your grass is dry? Grass in need of water will develop a gray-blue tint. Deep waterings are key. Water should penetrate the soil 6 to 8 inches. Watering this deep ensures that your grass develops a healthy root system while shallow waterings result in turf with shorter roots which lead to dried-out grass. Probe the ground with a screwdriver to test the depth of your grass roots. The rod should stop or give resistance once it reaches dry soil. Do not overwater as grass roots rarely reach deeper than 8 inches. Any additional watering questions? Call us, your friendly neighborhood lawn experts. We’re here to advise you on watering and any other lawn-maintenance issues.